The best editor helps you quickly add audio fade out effect with advanced features. Audio fade out, where sound becomes progressively softer until it can no longer be heard, is one of the most popular audio techniques today. This can give the audio track of a video a clean, professional sound. If you want to apply this kind of audio effect, Wondershare Filmora- an easy-to-use program can help you achieve that. Now follow the steps below to learn how to apply audio fade out effect to your video. Install and open Wondershare Filmora. Click the “Import” button to browse and import the video/audio file you want to edit. You can also directly drag and drop your video/audio file to the program. 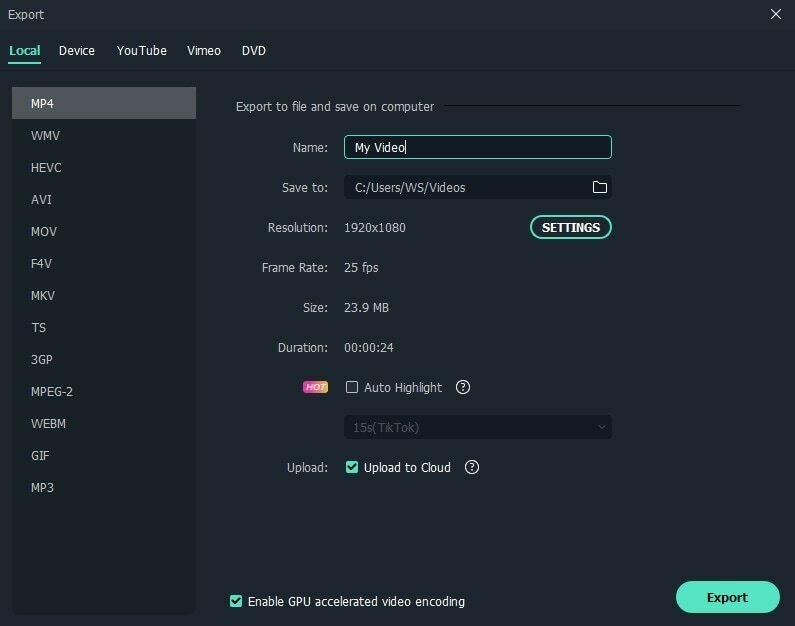 Wondershare Filmora supports various video and audio formats such as AVI, NSV, FLV, MKV, MP4, M4V, RMVB, TS, TP, TRP, M2TS, APE, CUE, AU, AMR, OGG and more. You can directly import these kinds of files without conversion. Drop your video/audio to the Video/Audio Timeline. 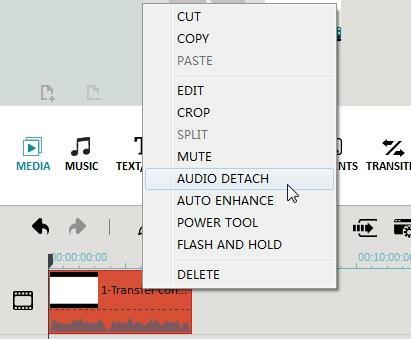 If you need to detach the audio file from the video, you can use the Detach audio feature in Filmora to accomplish it easily. Double click on the target file and switch to “Audio” column. Find the “Fade Out” option from the context menu. Then you can manually set the fade out length by dragging the slider bar to the right or left. If you make a mistake or want to change the length, click the “Reset” button. Then click the "Play" button to play the newly faded audio track. Then drag the slider bar until the audio is faded to your liking. If you’re satisfied with the result, click the “Export” button and then an output window will pop up. You can specify the output format, output name and output folder. If you want to specify the detailed parameters, click the triangle besides “Advanced settings” option and make some changes by clicking the drop down list. If you want to play the new file on mobile devices such as iPhone, iPad, iPod, Zune, go to the “Device” tab and choose a specific device from the list. You can also directly share the file to YouTube and Facebook in “YouTube” tab or burn to DVD in “DVD” tab. Actually, audio fading out is a simple task with Wondershare Filmora. With this powerful video editing tool, you can also combine video/audio, split video, rotate video, add image to mp3, and remove audio from video and more. Now download and explore more possibility for your digital world. There are times when a 5 second audio fade out isn't long enough. There are "end around" techniques I can use for a slower fade out, but it seems pretty simple for Wondershare to remove the 5 second cap. I have multiple clips already in my project, i added music but only want it on certain clips. On filmorago how do i choose which clip gets music and which dont. I tried muting music for individual clips but it mutes all clips. 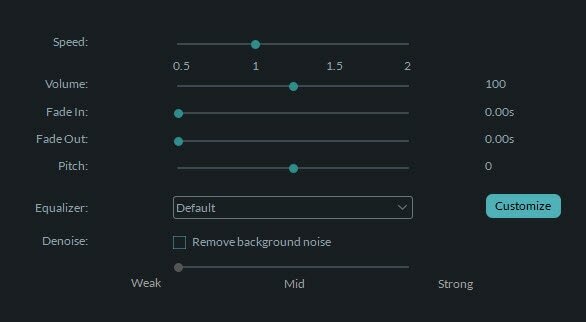 The Fade in/Fade out function of the audio isn't working. I've tried everything I could think of, plus googling possible solutions. Still not working. Please tell me how to rectify this. Thank you!